Our whole family is very excited about Christmas this year. Previously Ivy has been a little too young to grasp what was going on, but having just turned 3 she’s starting to understand the concept and is finding the whole thing really magical! This lovely book is perfect for her right now as it introduces lots of different aspects of a modern Christmas and shows her what she can expect over the coming weeks. 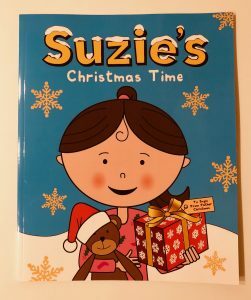 In the story, little Suzie can’t wait for Christmas to arrive. We see her start opening the doors on her advent calendar and write a letter to Santa. She visits a garden centre with her parents to choose a tree and then they all decorate it together. On Christmas Eve she hangs up her stocking and leaves a mince pie for Santa and a carrot for Rudolph. The next morning she wakes up early and runs downstairs in excitement. Will Santa have been? This is a fantastic book to introduce Christmas to toddlers and I imagine it would also be very useful for children who struggle with changes in their everyday routine. It breaks down the mechanics of Christmas really nicely, whilst building up a real sense of excitement.